My aim in this paper is to analyze Kant’s account, during the early 1760s, of the relation between judgment, distinctness of representations and ‘inner sense’. I will argue that Kant takes over and radically transforms important strands of Wolff’s thought on the same issues. Indeed, both Kant and Wolff define judgment with a view to the act of the mind performed therein. 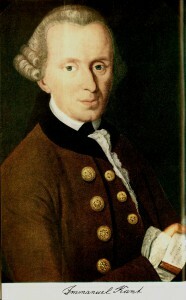 Kant however rejects Wolff’s attempt to explain the possibility of judgment through the gradual accumulation of lower cognitive acts (such as attention, comparison, reflection). Judgment, Kant argues, is a specific way of relating representations, and as such it points to inner sense as the faculty of ‘making one’s own representations into objects of representation’ (AA xxviii 79). While Kant does not yet distinguish between ‘inner sense’ and ‘transcendental apperception’, by comparing Kant’s and Wolff’s views on judgment, I will show that the faculty of ‘making one’s own representations into objects of representation’ is the forerunner of transcendental apperception. Correspondingly, the close relation between judgment and ‘inner sense’ might serve as a clue to Kant’s later derivation of the categories from the logical forms of judgment, which has often been criticized as arbitrary. This entry was posted in Philosophical and tagged Kant, Wolff on 07/03/2018 by Mary.